Hyundai Motor Group is expected to construct its new headquarters in southern Seoul, dubbed the Global Business Center, in partnership with external investors, a deviation from the original plan of completing it on its own. According to industry officials, Hyundai Motor Group has been contacting domestic and overseas investors to seek joint development of GBC, amid its move to save construction amount worth 3.7 trillion won and invest more on its future business growth. Last month, the automotive group said it would invest 45.3 trillion won to research and development and future technology over the next five years. Slated to be completed by 2023, the 105-story high-rise will serve as the new headquarters for 15 Hyundai affiliates and roughly 10,000 employees. 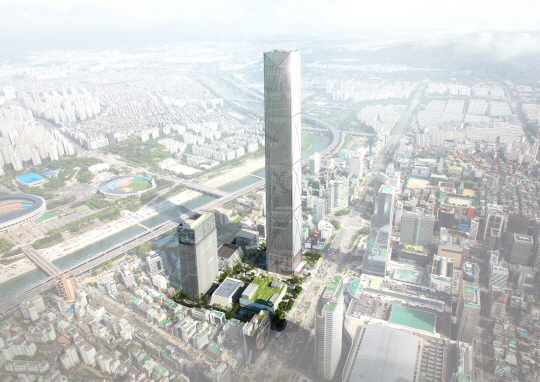 The GBC will also become the tallest skyscraper in Korea, taller than the 555-meter Lotte World Tower in eastern Seoul. In 2014, the Hyundai Motor Group purchased some 80,000 square meters of land from Korea Electric Power Corp. for a higher-than-expected price of 10.5 trillion won. Hyundai Motor Co. paid 55 percent of the amount, while Hyundai Mobis and Kia Motors forked out 25 percent and 20 percent, respectively. The joint development of the GBC will not only help increase the value of GBC but also help the group secure capital and future investment, experts viewed. But in December last year, the government hinted at clearing regulatory hurdles for the project as part of the government plans to foster economic growth by encouraging companies to make investments.